It may seem odd to refer to colorful flowers as friends, but that is what I think of the blooms of my red bird-of paradise (Caesalpinia pulcherrima) shrubs. They are located beneath my kitchen window and this time of year, the blooms have just begun to reach up to the window. What is even better is that the first blooms of the season are just beginning to open. The bright yellow, orange and red flowers brighten up my day as I work in the kitchen. Many visitors and new residents ask me about this beautiful shrub. It really is stunning in the summer landscape. Native to tropical America, Red Bird-of-Paradise is grown throughout southern areas of the United States, the Caribbean and has been brought to India and the Philippines. It thrives in areas with heat and sun. Depending on where you live, this is one shrub that has a multitude of common names…. In areas with warm winters, this shrub is evergreen. However, during the winter in my zone 8b garden, my shrubs go dormant and are cut back to 1ft. from the ground. This may seem somewhat like severe pruning when it is done each year, but it ensures beautiful shrubs in late spring. Cold hardy to zone 8a, they can be killed to the ground when temperatures fall into the teens. The foliage is also quite beautiful and grows back very quickly in the spring after pruning. Butterflies and hummingbirds are attracted to the beautiful flowers. I have seen some shrubs absolutely covered with butterflies in September. Plant in full sun or filtered shade. Shrubs planted in the shade will have reduced flowering and sparser foliage and so I recommend planting in full sun. Their size varies from 3 ft. by 3 ft. all the way to 10 ft. to 10 ft., so make sure you have room for it to grow. In desert gardens, they do require regular irrigation. I have planted many of these shrubs in both commercial and residential landscapes with great results. They are not fussy in the least. My shrubs are now 11 years old and have never been fertilized or the soil amended. There is another variety is called ‘Phoenix Bird’, which has distinct yellow flowers (not to be confused with Caesalpinia mexicana). I used this variety when I designed the landscape for my in-laws. Whatever you decide to call this beautiful shrub, it is just perfect for me…..it is beautiful and does not require a lot of work to make it look that way. Can You Recognize These Badly Pruned Plants? Beautiful view from your kitchen window with that glorious color ! That shrub is gorgeous…looks nothing like the big invasive bird of paradise I'm used to seeing. It has a delicateness to it's vivid coloring. Just beautiful. Lovely color to look at while you cook or wash dishes. Oops no one washes dishes anymore but me. Anyway it is beautiful to look at. Such fiery color. We got one last year, and the deer ate all the flowers on it. Then, our unusually cold winter finished it off. I need to find a place for another one. The yellow is pretty, too. Such beautiful flowers! They really are amazing. Those are lovely plants. I had not seen one in a long time and had forgotten about them! I have a friend who refers to all my plants as "your plant friends"…I like it! I also really like this plant. My brother in Phoenix has a couple in his garden and they are really stellar performers. No wonder you are happy these beautiful plants have returned they are gorgeous colours, flowers and foliage. They are gorgeous blossoms, Noelle. I love coming to your blog to see blooms that won't grow in my gardens. Thank you for sharing! Yes, they're wonderful friends, aren't they? Absolutely gorgeous! I need some! The red bird (probably called the dwarf poinciana in my area) has officially been added to my wish list! These are one of my favorites. Mine has also just bloomed, I look forward to it every year. We faced the east side of the house with these, alternating some clumps of bamboo muhly and three anacacho orchid trees. That area is a contast buzz of activity in summer as swallowtail butterflies and hummingbirds rocket through the blooms. Nice to see your blooms. My plants are in their first growth spurt, and I'm grateful to see that after a winter with temps in the teens more than once. Won't have blooms for a month, maybe. This is a stunning bush with such beautiful flowers! Love, love it! I agree that the leaves are very beautiful too! I've never seen these shrubs before, but they are stunning attention-getters! I think if I were a butterfly or hummingbird, I'd have to be blind not to go straight for it. I can see why you love them so much. I can see why you're so happy to see it Noelle! It's absolutely stunning. Such brilliant colors. Those colorful shrubs would brighten up any day. So beautiful to see them showcased specimen-style. Normally, I see them crowded in with other plants. I've always called them dwarf poinciana. The red bird of paradise name is too confusing to me because strelitzias are common here as well. Beautiful photos! It is a very pretty shrub I like the foliage too very delicate. What a gorgeous shrub! This gives new meaning to the term "hot colors":) I can see why the hummingbirds and butterflies would love this plant. Maybe people would like to check them all out! They are such wonderful plants for our climate! Wonderful to see blossoms. Mine are two feet tall and growing. A seedling is up to about 6 inches. I'm crazy about this plant and grow it with Tecoma stans. 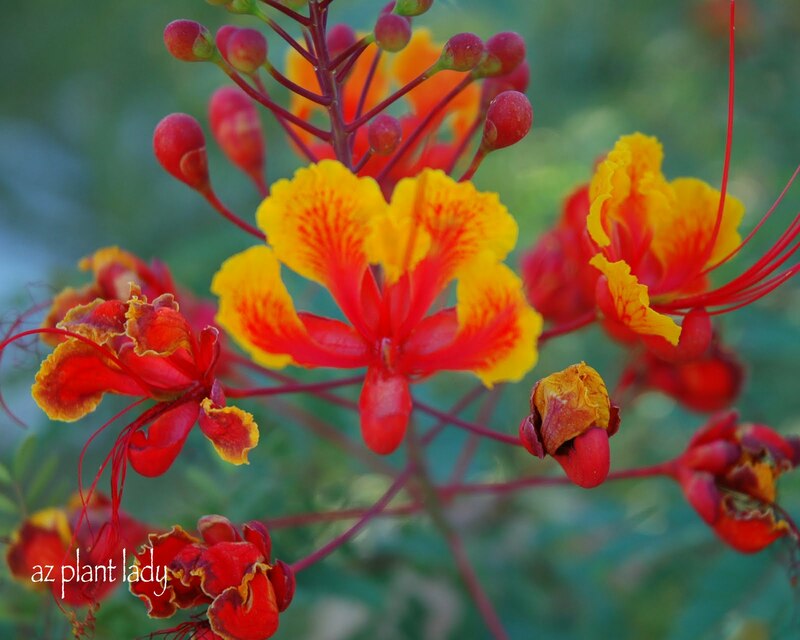 We call it Pride of Barbados. Butterflies are impressed by it, too. I just moved to AZ, and thanks to this blog (found via google search) I now know what this beautiful flowering bush is called! I absolutely love it. I love in SE AZ and thought it was dead when we moved in because it was just sticks. Thankfully, I didnt pull it out! I want to plant more now in my backyard (we're still landscaping). Thanks for the blog! I did a painting of this flower its so beautiful! helped me get the name and some good info on it! I live in Oakland (northern), CA and have been trying to grow this beautiful plant in my garden for the last 4 years. I first encountered it during a trip to Scottsdale, and I brought home a fairly good-sized one (bought from. nursery) in my car. It lost all its leaves in the winter and has not ever really recovered. Last year I bought another, larger plant at the Ruth Bancroft Garden’s plant sale, and at this point, it has only 5 or 6 branches with leaves — no flowers and mostly a stick-like appearance. What am I doing wrong with this “indestructible” plnt? I apologize for my late reply. 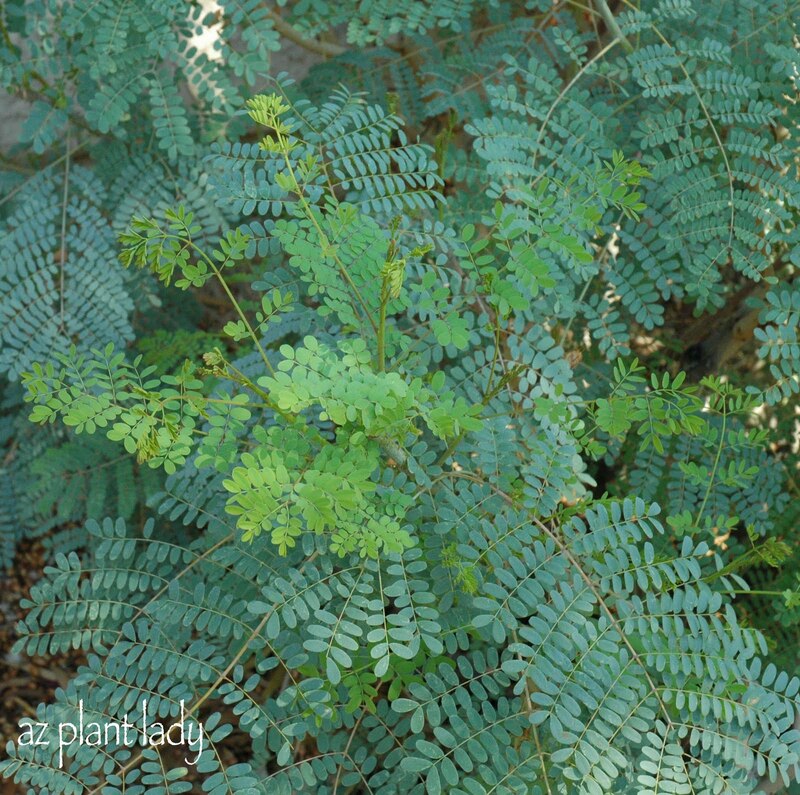 Caesalpinia pulcherrima will lose its leaves in winter as it is deciduous. Prune it back to 1 1/2 feet tall and wide in late winter. To become lush and bloom, they need full sun all day – especially in northern California where the sun isn’t as intense as in the Southwest. I hope that this helps! Ears of Silk in the Vegetable Garden Sunshine In My Life….